The mystery illness and a thank you. So like I had mentioned in my previous blog, I’ve been under the weather for the past few weeks. One of the things that has been plaguing me was a persistent case of hives. By this week it had spread to dangerous levels and I ended up in the hospital for a few days. So to continue with my “bad blogger” phenomenon I haven’t cooked a new or interesting meal in a long time (side note, B did make fake bacon wrapped scallops the night before I was admitted and they were flippin’ fantastic). Since I usually work from home and B works 8-10 hours in the lab, our dog Margot was very kindly looked after by our neighbors. As a thank you we wanted to make them something that fit our dog and theirs (Nola) since they had non-stop playtime for almost 48 hrs (with the exception of the few hours B was not with me and was at home). In honor of the two dogs and to thank our neighbors, we decided to make Margot-rita and Nola Chocolate Cherry Cola Cupcakes. The decorative aspect of these..is.uh..well…lacking. I do not attest to being anywhere close to a decorator and this proves it. I didn’t calculate the points values since they were a gift but I’m sure they’re not Weight Watchers friendly. Preheat oven to 350°F. Line a cupcake tin with liners. Whisk together margarita mix, tequila and Triple Sec in a small bowl. The combination should measure a bit more than 1/2 cup. In a large bowl, blend cake mix, egg whites, vegetable oil, lime zest and the margarita mix. Blend on low for about 30 seconds and then increase speed to medium and blend for two additional minutes. Batter will be slightly lumpy. Spoon the batter into cupcake liners (about ¾ full). Bake for 20-25 min, or until toothpick inserted in center comes out clean. Let cupcakes cool for about 10 minutes in the pans, then remove them to a rack to cool completely. Once cupcakes are completely cooled, prepare the icing. Place butter in a large bowl and beat with electric mixer until butter is fluffy. Add powdered sugar, salt, lime juce, tequila, and lime zest. Mix until thick and creamy. Add more powdered sugar until the frosting is of a good spreading (or piping) consistency. (You can mix in a tiny amount of green food coloring or gel paste if you’d like the frosting to have a green tint but I was looking for a buttery color). Ice cupcakes in whatever manner you prefer either by spreading or piping the frosting. Use small lime slices and a sprinkle of coarse sea salt as garnish. 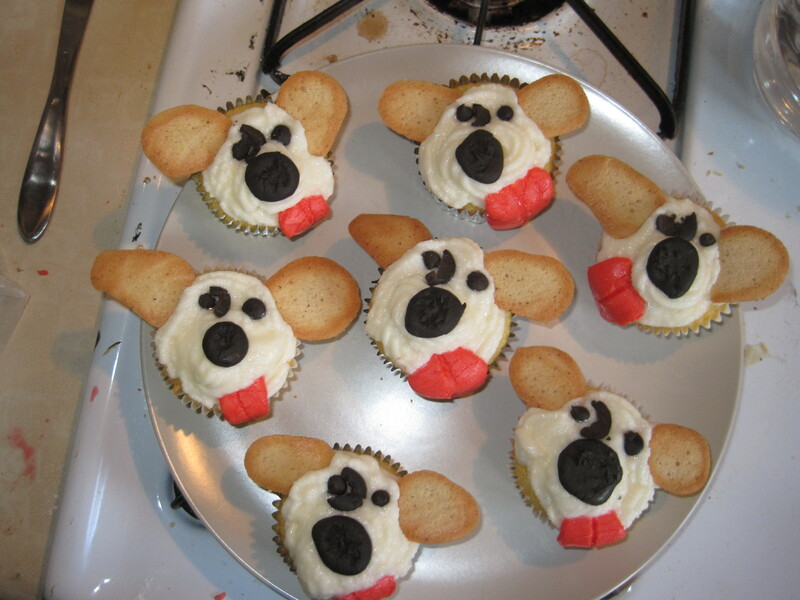 For the specific decoration of these cupcakes, I piped on the frosting and then tried to build up a snout. Unfortunately the buttercream ended up getting a little warm in my hands and melted a bit so the snout doesn’t look as good as the cola ones (see below how I did that one). The night before I made up some dark brown and pink royal icing and piped that into eyes, noses, and tongues. To get the texture on the tongue and noses I let the royal icing dry to a certain extent then used a toothpick. For the tongue I just drew a simple line. When I was applying, I cut the tongues to the appropriate length. For the noses, I used a toothpick and just made little holes and played with it a little to give it some texture. For the eyes and noses, the piping attachment I used made them look a little like chocolate morsels since I had to pull up. I also used the toothpicks to even that out so they looked flatter. The royal icing recipe I used came from Annie’s Eats. The ears for Margot were made out of tuile cookies. I did not make them right so we kind of winged it. She has ridiculous ears so we were ok with it. 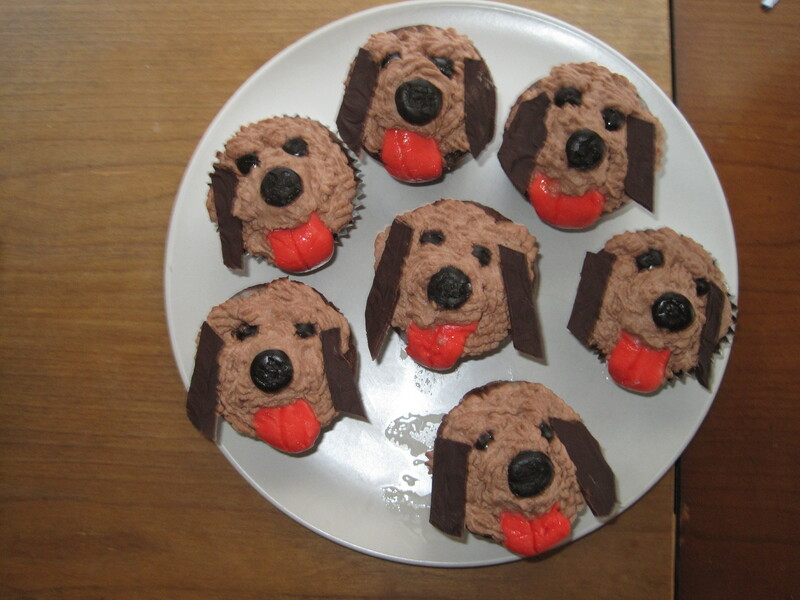 Maybe one day I’ll figure out how to roll a cookie and in the future I can make a cupcake that has terrier like dog ears. For cupcakes: Preheat the oven to 350° F. Line a muffin pan with foil or paper liners. In a small pot, add about 1 1/2 cups of coca-cola (or another comparable cola). Turn up heat and allow the cola to reduce down to more of a syrup (This was done to intensify the coke flavor in the cupcakes). Once this is reduced down measure into a liquid measuring cup and add coke, as needed, to get 3/4 cup of coke (I ended up with about 1/2 cup of reduced coke syrup from the 1 1/2 I started with and then topped it off with more coke). Set aside to cool.In a medium bowl combine the flour, cocoa powder, baking soda and salt. Stir together and set aside. In the bowl of an electric mixer fitted with the paddle attachment, combine the sugar and butter. Mix on medium-high speed until light and fluffy. Mix in the egg until incorporated. In a bowl or large measuring cup, combine the buttermilk, Coke, maraschino cherry juice, and vanilla extract; stir to combine. (This mixture may look disgusting and/or curdled – it’s okay!) Mix the dry ingredients into the butter-sugar mixture on low speed, alternately with the liquid ingredients, beginning and ending with the dry ingredients and mixing just until incorporated. Divide the batter evenly between the cupcake liners. Drop a stemless maraschino cherries into each cupcake well and push them down into the batter. Bake for about 15-20 minutes, or until a toothpick inserted in the center comes out clean. Allow to cool in the pan 5 minutes, then transfer to a wire rack to cool completely. For glaze: Add the cherry cola, 1 teaspoon at a time, to the powdered sugar until it has a good consistency to drizzle on cupcakes. Once cupcakes are cool drizzle the glaze onto them (make sure there is a baking sheet or something under them! It got messy for me). For icing:Combine confectioners’ sugar and cocoa in small bowl. Add cream and vanilla; beat until stiff.Using a piping bag and one of the fancier attachments (I have no idea how to describe these) I piped the the whipped cream icing on in little dollops. When the cupcake was completely covered, I cut maraschino cherries in half and placed on in the lower center of each cupcake. Using the remainder of the icing, I covered the cherry to create a snout.